5 pc. Indexable Carbide Tool Bit Set - 3/8"
Grizzly G5639 - 5 pc. 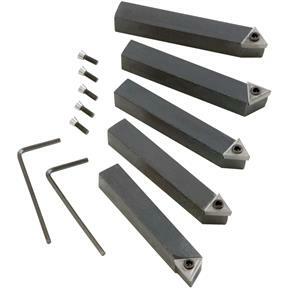 Indexable Carbide Tool Bit Set - 3/8"
This 5-piece 3/8" turning tool set features indexable carbide inserts with "spline" type hold-down screw that allow indexing without removing the screw. Each set includes AR, AL, BR, BL, and E style tools with carbide inserts, wrench, extra hold-down screws, and wooden case. See TiN coated carbide indexable inserts, items T10381 and G6707 for replacement inserts. Uses ISO inserts TCMT110204, or ANSI inserts TCMT21.51. I bought these along with a quick change tool post. They do what they're suppose to do. I am not sure of the quality of the inserts because of the finish of the work and I chipped 2 inserts. Inserts are a consumable item and you are going to buy replacement inserts anyway.